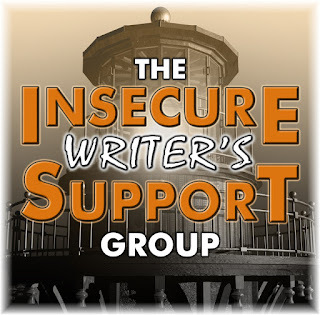 Yes, it's that time once again - 2016's third posting for the Insecure Writer's Support Group. This excellent group was founded by Ninja Captain Alex J. Cavanaugh to provide a safe haven for writers to share doubts and insecurities without fear of appearing foolish. This month's co-hosts are Lauren Hennessy, Lisa Buie-Collard, Lidy, Christine Rains, and Mary Aalgaard. First, thanks for all your supportive comments on last month's post. I really appreciate it and reading through them made me feel a lot better. (Go here if you don't know what I'm talking about). It's true that I haven't been around the blogs too much since then - I literally just finished returning the comments from that post! I've been getting a lot of headaches, so I've been reserving my energy for my editing work and trying to make some headway on my WIP. Haven't managed to write every day, but on those when I did I've been averaging about 500 words. However, on that last bonus leap day I managed 1000 and that's the goal I want to aim for going forward. So, in terms of my monthly goal round-up, I'm up to 10,000 words with 4,000 added in the last month. Doesn't sound like much, but at least there's quite a lot going on in those words. Things are happening. I'm still speaking with the police and they've been taking my attackers in for questioning. I really hope they can do something because these people shouldn't be at large to pose a threat to someone else. Apart from that, I just keep drinking lots of water and trying to write the next word. Keeping things quite simple at the moment. I didn't meet my marketing goal, but I definitely want to try some new things this month. Go here to check out lots more IWSG participants. The quality of the writing done matters far more than the quantity. I hope your attackers are brought to justice for what they've done. No one should be able to get away with attacking someone like that. Glad you are feeling a bit better, Nick. I think you can be proud of your work this month. You've battled on through a tough time, which says a lot about your strength of character. And just enjoy the rest and peace and quiet on the not so good writing days. That's okay too. Hope you continue to feel better! Hi Nick - oh gosh I'd almost forgotten - as I should have emailed too. I know it's a month on - but I imagine you're still feeling frightened, worried and anxious .. one just simply doesn't need that sort of thing. I'm pleased to read the police are taking it seriously ... and I hope the fracture clinics are going to help heal you up. The headaches don't sound helpful ... so yes lots of water, rest and not too much eye strain - as you say keeping things simple. I hope the wheels of justice turn in a favorable manner. Leap Day sounds like it was a big leap forward, keep it up! Sounds like you've accomplished some great writing goals! When we add all the words, they amount to a lot more than we think. Glad to hear the police are working on it and you're doing well. And you're writing! That's wonderful in light of the traumatic events of last month. All new words are good words no matter how many or few they may be. Glad to hear you're doing better, Nick. Taking things easier, keeping things simple, is a great idea. Hang in there! I hope they bring those jerks to justice. Just take it at a pace you can handle, Nick. Nick, I'm so sorry about last month's attack. I'm glad you are just keeping on keeping on. The raise in your words is good news, and I hope it and other happy things help with the healing. Glad you updated, Nick; was wondering how you were fairing. Glad too the police are doing what they can to hopefully get these guys punished for their attack on you (and sadly probably others as well). Do take care of yourself and keep it simple with what you are trying to accomplish; allow your body to heal as well as emotionally too. Nick, I think it's incredible that you've been able to write at all after what you went through. Sending prayers that your attackers receive the justice they deserve and that you continue to heal and recover. PTSD is tough after a traumatic event. Be gentle with yourself. You need time to heal on all accounts. I hope the police do something about those guys. I hope you feel better soon. Take it easy and take care of yourself- that's what's important. 10,000 words is pretty darn good. I really hope they catch the culprits. Nobody deserves to go through that. I hope you heal up soon. That's pretty good progress, especially considering the stress (physically and emotionally) you've had to endure. I hope the headaches subside soon. Take care. You just keep at it. You know we're fine with you getting around as you're able. I'm still just baffled when I think about your experience. I'm so happy to hear that you're feeling a bit better. Well done with the writing, Nick. You've got quite a bit done considering that you've been experiencing lots of headaches. Writing is a form of therapy too...keep at it. Drink lots of water and write the next word. I may hang that up next to my computer. It's perfect. I think you did a great job on word count. Hope things keep looking up for you. I really hope those guys go to jail. What they did is awful. Good luck with writing this month. Just keep at it. I feel sick every time I think of what happened to you. A concussion can take a long time to heal. It sounds like you're getting back into the writing. Congrats on the words. I'm glad the police are dealing with those guys. That really sucked. Do you think the headaches are related to the concussion or is it something else? Way to go on your writing! Please take care of yourself and feel better. Prayers and virtual hugs coming your way. I'm so glad the police are doing something. And it's not the quantity of the words that you write. It'll get finished eventually, and you'll have the energy to do more eventually. Take care of yourself now. And one day, you might just have a great story come from this horrible experience. You're being productive in the face of this horrible act. I hope there's justice and that your headaches vanish. I hope justice is served. Great work with your writing! I've flunked last month with marketing myself. Need to get going with that! I hope the law sides with you, and I'll continue to think positive thoughts for your healing. Oh my gosh, Nick, I missed your post last month and just caught up. I'm so sorry that happened! It made me sick just to read it. I'm so sorry you've been suffering from headaches because of that assault. I hope that there will be some justice for those horrible creeps. Glad that you have been able to get back to your writing. Take care! Staying hydrated is important for the creative process. And even if you only get down 200 words, it's a step forward. So you are doing great!! So very sorry for all you've had to go through. It sounds very stressful, but take time to heal. Time and lots of hugs will be the best cure. Just take your time and try not to dwell on the snail's pace of justice. I hope justice is on your horizon soon Nick. Find some peace. What a shock to be attacked, and with your dogs with you. So sorry that happened to you. Of course, you'll have some physical distress from it. I hope you are recovering well. The headaches could also be from the trauma of the attack and the blow to the face. Take care! Write when you can, and be safe. Glad you are making some progress and feeling a bit better! Thanks so much for stopping by my blog for Hilary's interview. She's a treasure, isn't she? Glad to hear you are able to write despite your headaches. I do hope there is justice with your attackers so that you can move past this in that sense. With time, your headaches should lessen. Take care! You've done great this month! Don't let goals get in the way of progress. I hope something comes from the police interviews. Sending you healing vibes, and happy to know you're coping. Take care, Nick. I really hope that justice prevails. It would be terrible if those people just walked around free to hurt others. It's bad enough that it happened to you. I mailed you but I'm not sure if you received the e-mail, so I PM'ed you on Facebook. I think your doing great. Keep that word count up. Keep on a keepin' on. I didn't say anything, but 2 months ago. I had a home invasion. I live alone, and I was sleeping. I sleep like the dead because I'm on medicine for essential tremor. However, I "felt" something in my deep sleep, and without opening my eyes, I reached over - I was laying on my right side - and grabbed the heavy-based lamp on my night stand. I turned to my left and there was a man, grabbing for my head. At my feet, was another man, getting ready to grab for my ankles. I am not physically afraid of anybody, or anything; it's just a weird quality I possess. I swung that lamp and missed the guy at my head by and inch; it put a dent in my wall, then I came up out of my bed, like all the furies of Hell and went after these a-holes. They ran like the wind. I live in a very bad neighborhood, but because I am on a fixed income, I cannot move. This isn't the first time I've gone after someone, nor is it the first time I've had a home invasion. I am so sad to hear you were attacked~ I hope you are okay! This is so scary~ I wasn't sure which blog to visit you on?! I hope things get better and keep writing and do try something new~ All my best! Please swing by my blog to see what you've won! I didn't know about your attackers. That's horrible! I hope they are brought to justice. Hope you feel better, too. I'm impressed that you're still writing in spite of the nasty things you've been through. Keep going! Hugs! Have you received your copy of Beneath The Rainbow by Lisa Shambrook?